The last day and a half (and let’s face it, we’re probably not done) have been an introvert’s dream. Sure, I typically set aside a fair amount of my time for myself. If you call me in the evening to go do something and I don’t already have plans, I’ll be tempted to say yes, but will probably still tell you I’m busy because I have already committed myself to stay home and do nothing. And by “do nothing” I mean watch TV (a healthy and balanced rotation of Netflix, Hulu, and the recently re-acquired HBOgo), write, dance, drink chardonnay, take a bath, listen to “The Stranger” by Billy Joel, and eat a substantial amount of popcorn. I’m not a total homebody – I spend the majority of my time outside of my house with friends and strangers in Nashville and all over the world, which means that each decision to stay in follows a fierce internal debate between my love for solitude and my fear of missing out #FOMO. But this is different from that designated introvert time in which I regularly indulge. A snow day is MANDATED BY NATURE. Believe me, I wholeheartedly realize that this weather event is not as impressive as others around the world. I’m not insisting or even suggesting that Nashville’s #icepocalypse2015 is severe enough to warrant this type of shutdown. I’m used to the overhyped predictions and the underprepared Dept. of Public Works. As much fun as it is to complain about things that no single human can control, the lack of “real snow” experience in my childhood and current life stage has never disappointed me because I know where to set my expectations. I’m used to being mocked by my friends who live in snowier climates while we hunker down with our milk and bread to wait out a fruitless threat of a wintry mix. But I’m quite content with my rare delivery on winter weather. When the bands and blobs of pink radar float across middle Tennessee and precipitation does occur, it’s all the more lovely. Not lovely in a “oh, what fun it is to slide down a hill that looks like it could spit you right out into the street” kind of way. Not lovely in a “it sure is pretty but I’m glad we don’t have to shovel it every day for one-third of the year” kind of way. But lovely in a “sorry, i can’t. i’m trapped inside my home and my pro/con list is all pros” kind of way. Unlike anticipating a snow day in high school, I’m not frantically praying for enough ice to delay my physics test a day or two – just casually hoping for some everyday, totally do-able deprivations. Can’t go for a run — too slick! Can’t run errands — no reason to put myself and others in danger! Can’t go to work — office is closed! It’s a sick day, but you feel fine. It’s a called-in-sick day, but you didn’t have to lie! Sure, I have the luxury of being able to work remotely and I just may take advantage of that luxury at some point today (maybe tomorrow… definitely by Thursday). In anticipation of this storm, I toyed with the idea of “accidentally” leaving my laptop at work, but thankfully decided against that. And I do remember, without much fondness, the days when being kept from working my hours somewhere felt like the complete opposite of a free vacation. I’m also grateful to have not yet lost power in my house. I do not take for granted my warmth, my freezer full of food, and MOST IMPORTANTLY, my dear love Stevie the TV (© Joey Tribbiani, I know). My body, certainly, and my mind, almost as certainly, will be just fine to continue this unplanned hiatus for a couple more days if necessary. If I can’t get out of my driveway tomorrow afternoon, I’ll be shuffling on foot to M.L. Rose for a beer with a side of some 3-dimensional interaction — and a few of you may be targeted for a long overdue catch-up phone call. But for the most part, I’ll take what I can get and relish every moment of this rare and beautiful gift of a completely unplanned, uncontrolled, uninterruptible day (or three) to myself. 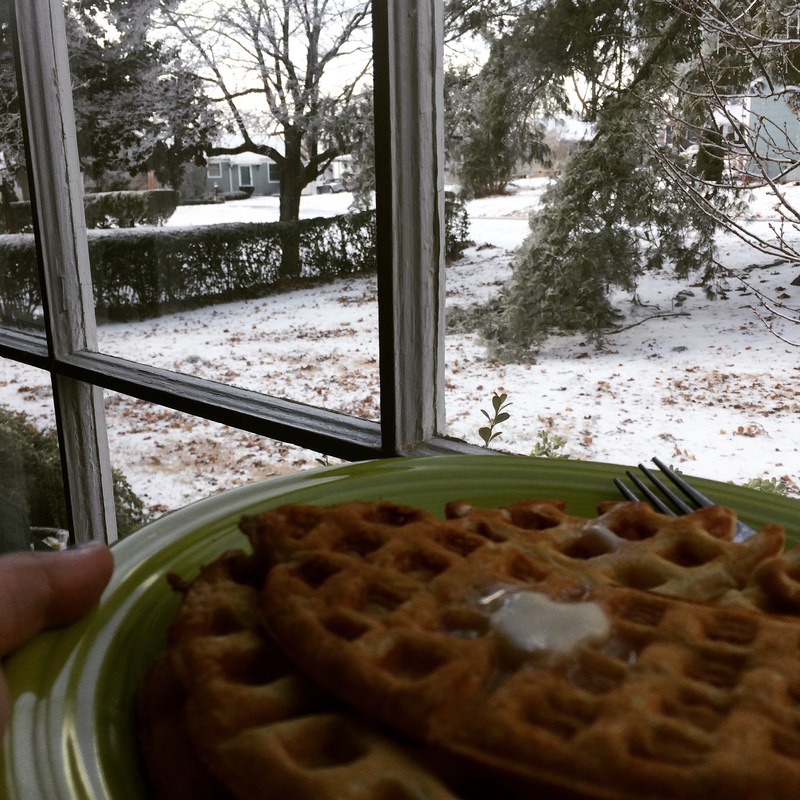 In the middle of writing this, I came across Linda Holmes’s blog post about grown-up snow days that is really great and, like most things she writes, I wish I had written it myself. Hope life is treating you well since your YAV year! ha! thanks, byron! you are right – we are coming from completely opposite iced-in places. thanks for your words and i hope you guys are back at it soon!